Lockhart’s Landing is located in Clearwater Lake Provincial Park on the southshore of Clearwater Lake. Clearwater Lake on many maps is also known as Atikameg Lake. Atikameg means “whitefish” in Cree. Our cabins are approximately 25 miles northeast of The Pas Manitoba, and are accessible by Highway #287. For those of you trailering a boat, you travel on paved roads to within 300 meters of our cabins, when you turn onto the access road. The Pas is approximately a 6 hour drive north of Winnipeg, Manitoba. Commercial flights are available from Winnipeg to The Pas Airport, only 5 miles from Lockhart’s Landing. 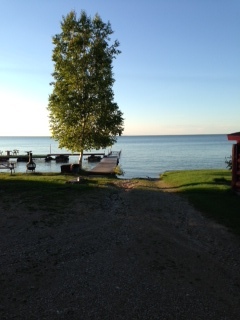 Clearwater Lake is recognized worldwide for its crystal clear waters and many a fishermen have tales of fishing success. Lake Trout & Northern Pike are abundant in Clearwater Lake. Walleye & Northern Pike fishing is close by at Cormorant Lake, while other species of fish are at several other lakes within an hour’s drive! Lockhart’s Landing is owned and operated by Tracy (nee Millar) and Dallas Lockhart. Tracy is originally from The Pas and was raised on Clearwater Lake during the summer months. Tracy and Dallas have always brought their family “back home” to the lake for summer vacations and are excited to welcome you to Lockhart’s Landing. A great place to have a family reunion! If you have pets, please let us know so we can discuss options. Call or email us for rates.